Former state Rep. Peter Aduja died Tuesday at the age of 87. In 1954, he became the first Filipino-American to hold a major elected office in the U.S.
Former state Rep. Peter Aduja, the first Filipino American to hold a major elected office in the United States, died Tuesday on the mainland. He was 87. Aduja's daughter, former state Sen. Melodie Aduja, called her father "my mentor and backbone." In 1954, when Hawaii was still a territory, Aduja was elected to the House of Representatives as a Republican. Aduja came to Hawaii with his parents when he was 7. He was born in Salindig, Vigon, Luzon, Ilocos Sur, Philippines. "He came with his immigrant parents to Hakalau, where his father worked as a $1-a-day laborer on the plantation. 'We came from nothing. We slept on plain wooden boards and cooked over an open flame,'" Aduja said her father told her. Amy Agbayani, University of Hawaii director of Student Equity, Excellence and Diversity, said Aduja has a place of honor in Hawaii and national Filipino-American history. "He was an attorney at a time when there were very few Filipino lawyers. He will be remembered for the opening he gave to other Filipinos," Agbayani said. 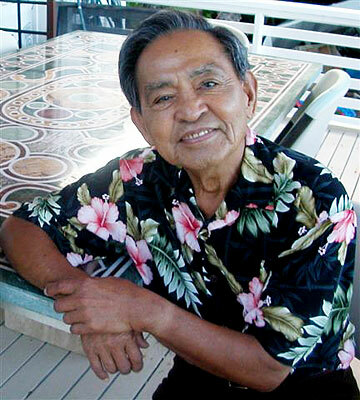 After graduating from the University of Hawaii in 1944, Aduja served in the First Filipino Infantry Regiment -- with former Rep. Emilio Alcon, ILWU leader Tony Rania and former Supreme Court Justice Benjamin Menor. He was a teacher at Naalehu Intermediate School on the Big Island for a year, before attending and graduating from Boston University Law School. He served as a District Court judge from 1960 to 1962. He also served in the territorial Legislature from 1954 to 1956 and from 1966 to 1974, and he was a delegate to the 1968 state Constitutional Convention. Aduja is also survived by his son, Jay Peter Aduja, and two grandchildren, William and Amber Aduja.